Secret to passing the driving test? 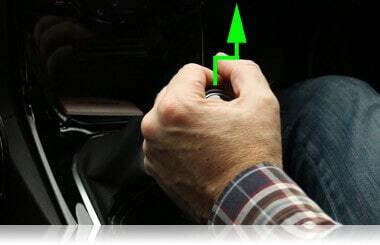 How to change gear in a manual car using the palming method. How you change gear in a manual car is important. Changing into the incorrect gear could result in you losing control of your car or stalling. It's very easy to slip into 4th instead of 2nd if your changing gear technique is not perfect. We're going to have a look at the 'palming' method which is the most reliable way of changing gear without making mistakes. You won't pick up any driving faults for not using the palming method on your driving test as long as you're in the correct gear at the right time. You won't have the luxury of looking down at the gear lever when driving, so make sure you memorise the diagram on top of the gear lever as to where the different gears are positioned. Once you've memorised the diagram, practice looking out of the front windscreen and try to change through the gears. 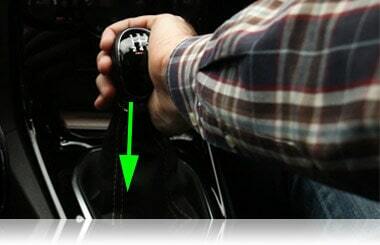 Reverse gear can be in a different place depending on the car that you're driving. More on reverse later. If the engine is on, make sure that you press down the clutch when changing gear. To save fuel, practice changing gear with the engine off. 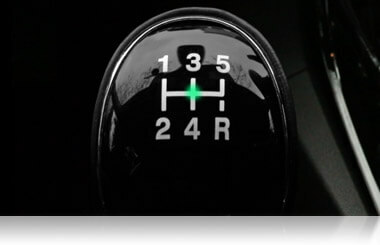 The gear lever is spring loaded and it will always spring back to the central neutral position just under 3rd gear and above 4th (remember this for later). Neutral is not in any gear. When in neutral, the gear can be freely moved left and right. You wouldn't be able to do this if it was in gear. You should always start the car in neutral to make sure that the car doesn't jump forward. Remember that the gear lever is spring loaded and springs to the central neutral position. Use the palm of your hand so that it's facing away from you on the side of the gear lever and your thumb is pointing down. Your hand position will push against the spring. Move it left and then forwards to 1st. To change up from 1st to 2nd, keep your hand in the same position with your palm facing away from you and your thumb facing down. This will stop it springing into neutral. 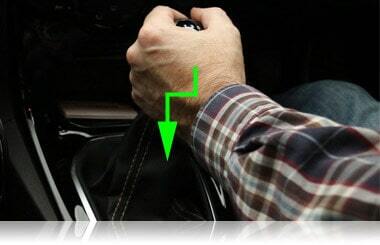 Hold the gear lever lightly to the left as you move it backwards to 2nd. If you don't hold the gear lever lightly to the left as you move it backwards then you could accidentally go into 4th gear. Changing to 3rd from 2nd is a two step process but it can be easy as long as you don't force it. 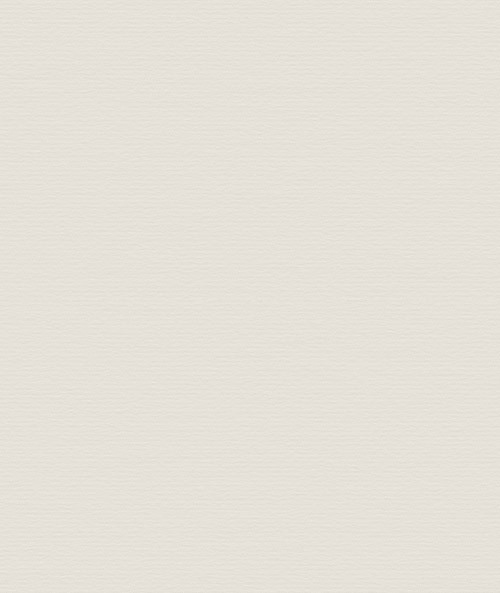 This time your thumb will be facing upwards and your palm will be facing towards you. This allows it to spring to the central neutral position. 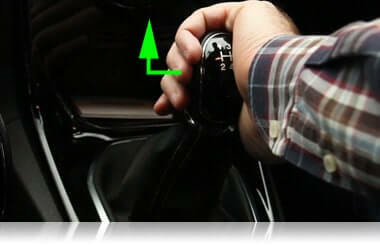 Push the gear forwards lightly, letting it spring to the central neutral position and then push forwards again to 3rd. Make sure that you grip the gear lever lightly and remember not to force it into 3rd. This ones a little easier. Hand in the same position with your palm facing you and thumb pointing upwards. 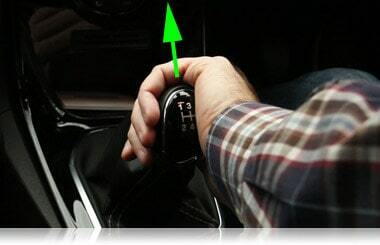 Move the gear lever straight backwards without moving it left or right. Hand in the same position with your palm facing you. Push lightly forwards to neutral, then to the right and forwards to 5th. It's recommended that you 'block' gear change down when feesible. Which basically means skipping gears and not to change down through each gear (5th, 4th, 3rd, 2nd, 1st). You can block gear change from 4th to 1st for example. It's also possible to 'block' gear change up if you have enough speed for that gear. 'Block' gear changing (also known as 'selective' gear changing) is less work for you and better for your clutch and gearbox. But you might not have slowed down enough to block gear change or maybe you need to change down a gear to help overtake. We'll now have a look at changing down through the gears. Have your palm so that it's facing yourself. Push downwards lightly, let it spring to neutral and then downwards again to 4th. Thumb pointing upwards, palm facing you. Push forwards in a straight line. 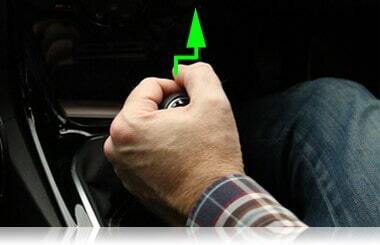 Because you'll be pushing against the spring to change into 2nd gear, your thumb points down and your palm should face away from you. 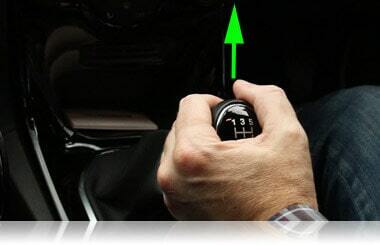 Push the gear lever backwards slightly to neutral and then push left and backwards to 2nd. 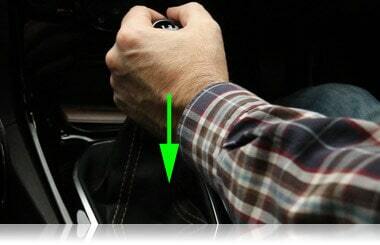 Having your hand in this position will help to push against the spring and avoid changing into 4th gear accidently. Hand in the same position with your palm facing away from yourself as you need slight pressure pushing to the left and then forwards to 1st. If you don't hold it lightly to the left then it might go into 3rd gear. 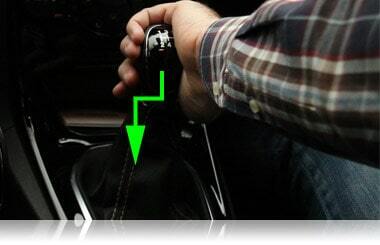 The position of reverse gear can vary depending on the make and model of car. Sometimes you might have to lift up a collar or push down to select reverse. 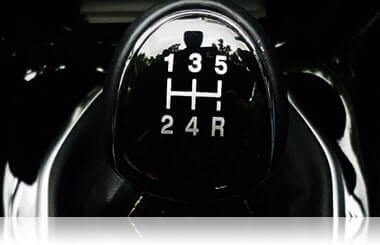 Reverse gear is represented by the letter 'R' on top of the gear lever.